The gun safe has inner dimensions measuring 6.3 x 9.7 x 52.17 inches. This translates to 1.83 cubic feet and good enough for 1 to 4 rifles depending on how large they are. The exterior dimensions are 8.6in x 9.8in x 52.17 inches so the safe does not take up a lot of room. If you don’t have a long gun then this safe is not for you. You can check out basic Barska Biometric safe, it’s smaller but security wise does the same. 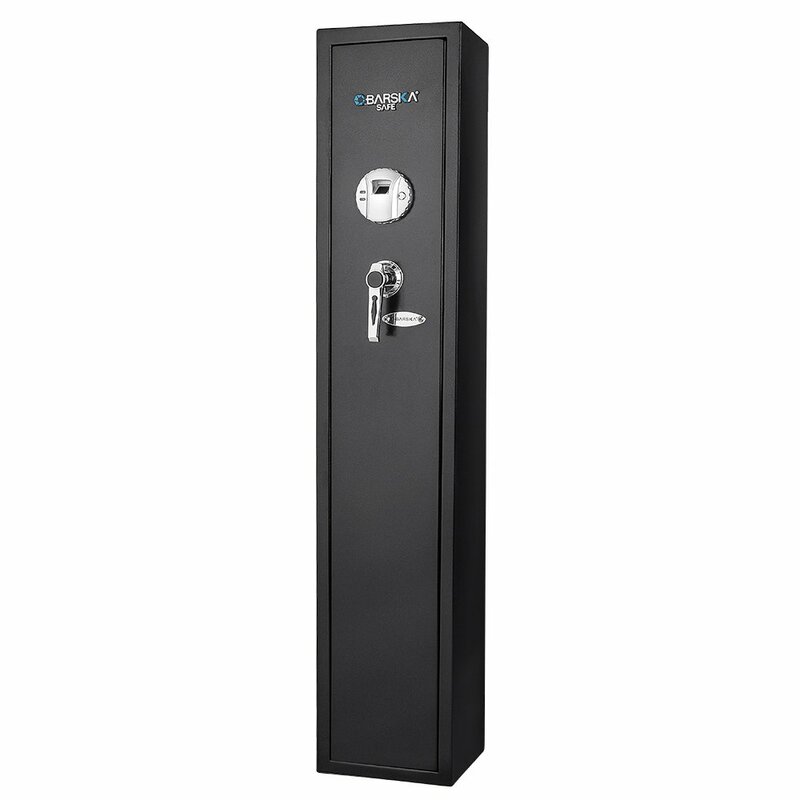 The AX11652 meets the CA DOJ requirements for gun safes, and that alone says a lot about its quality and durability. Its locking mechanism consists of three solid deadbolts made of steel. The rest of the AX11652 is also comprised of steel so its going to last a lot longer than the typical gun safe. The AX11652 is located at the door. 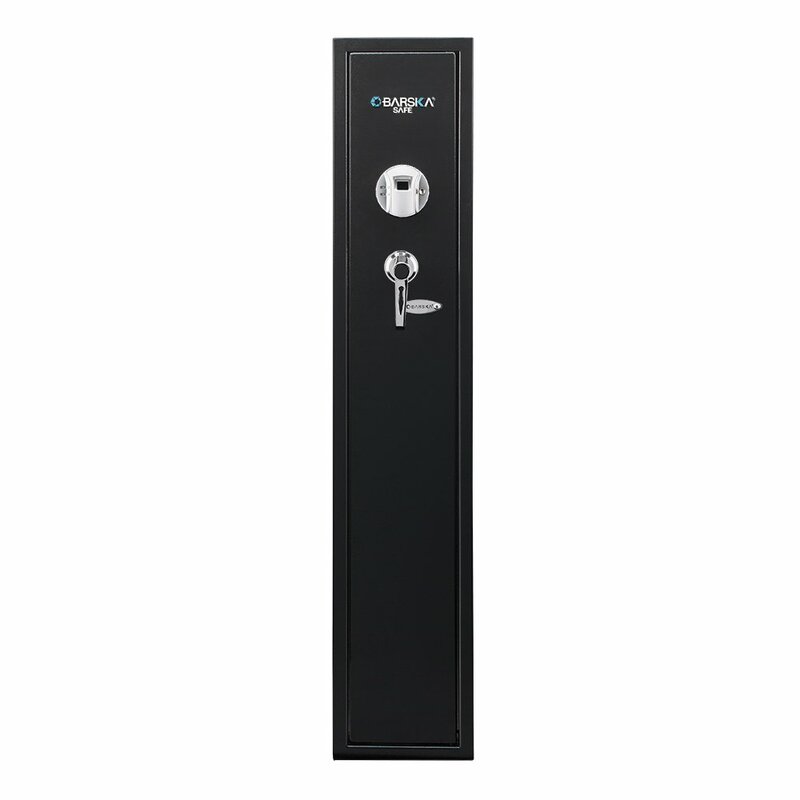 It is as easy to use as other biometric gun safes, but it has a greater capacity. You can store 120 unique fingerprints on it. This might seem like overkill, but it is a good option especially if a lot of people use the safe. Registering fingerprints is easy and straightforward. Once your prints are in the database, the safe will only open to the ones that are in its memory. If a finger touches the scanner and attempts to open it, the AX11652 will check if its in the database. If a match is found, the safe opens. If there is no match, the safe remains locked. This may sound involved, but it only takes a few seconds so your accessibility is not slowed down. The gun safe is made of solid steel, and its been designed to provide maximum protection. There are pre-drilled mounting holes so it is easier to position the safe. Once you have located an ideal location, use the provided hardware to set the AX11652 up. The AX11652 is built with an emphasis on durability. The door is resistant to prying and the inclusion of the deadbolts add an extra layer of security for the sides, bottom and top. Inside the safe is a four position gun rack thats designed to keep your rifles safe and organized. There is carpeting on the floor of the gun safe to provide protection for your guns. This is a nice add-on that ensures your guns paint job wont be damaged by the bare floor. Apart from the gun rack, the AX11652 also has a shelf where you can store ammo, pistols and other gun paraphernalia and other accessories. You can even take off the shelf if you want to store more rifles in the safe. This level of customization is hard to find in other gun safes so its nice to have it here. An external battery pack is included. This is something that will come in handy in case the battery power has gone down. If the batteries are running low, just plug the battery pack into the module and youll get power to open the AX11652. The biometric fingerprint scanner is not the only security feature on the AX11652. You also get a traditional key to open the lock. The lock is situated on the nameplate, and this enables you to open the safe anytime you want. The safe is solidly built and easy to use. The steel housing means this will last for years with no maintenance needed. The durability is not just found on the exterior but the interior as well. The addition of the carpet and the shelves are good and allow you to get more out of this gun safe. The fingerprint biometric system also works without any problems. The name Barska is synonymous with high-quality gun safes and Im glad to say that the AX11652 lives up to the companys reputation. There is a growing number of biometric rifle safes, but few provide the features that a discerning gun owner needs. This Barska biometric rifle safe review is happy to point out the AX11652 delivers on all fronts and does precisely what it is supposed to do, function as a safe for your rifle. It does not have a lot of fancy features, but theyre not necessary anyway. If youve got a long gun or two and want to make certain theyre secure, the AX11652 is a great option.